The Los Angeles City Council recently provided final approval for Providence Tarzana Reimagined – a $540 million construction and enhancement project of a hospital designed to reflect the changing art and science of health care. In 2008, Providence Health & Services acquired the original Tarzana hospital which was built in 1973 and pledged to expand and enhance the tradition of excellent care. With advances in technology, changes in patient care philosophies and the development of procedures that allow for fewer days in the hospital – or even treatment as an outpatient – Providence Tarzana sought to design a hospital for the future. 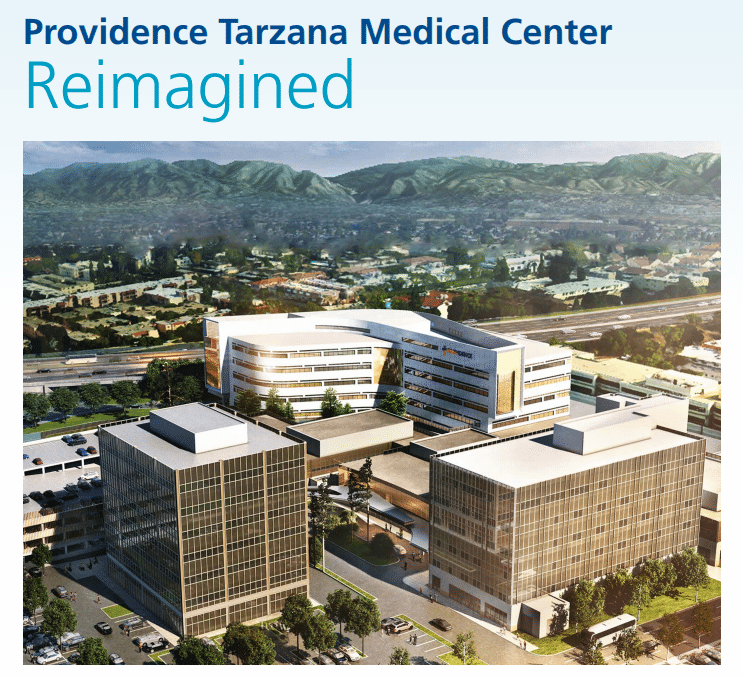 Providence Tarzana Medical Center (PTMC), ranked among the nation’s top 100 hospitals, will invest more than $540 million to build a new, state-of-the-art patient care wing, featuring all private rooms and a new Emergency Department, as part of a major redevelopment of the medical center campus. “Providence Tarzana Medical is ‘reimagining’ health care for the whole person. Providence Tarzana has also been working with the state agencies to design and approve renovations to existing facilities in response to the state-mandated seismic upgrade deadline. The seismic upgrades include installing massive girders under each floor of the existing hospital which entails moving power, cooling and technology currently in these spaces. You can also find project news, FAQs and updates on the Tarzana Reimagined website. What are the Challenges with the Tarzana Reimagined Project? The complexity with the Tarzana Reimagined project is that it is phased construction developed on an existing working site, and the current hospital needs to continue to operate on a 24×7 basis without any downtime. As certain areas undergo construction, services will be moved to alternate locations within the hospital or to other buildings on campus. How is Vantage Adding Value to the Tarzana Reimagined Project? Vantage has already been working with PTMC and Perkins+Will for about 18 months in the schematic design, design development and construction document phases for the new Patient Tower and new Main Lobby Building. We provided technology consulting services to address issues associated with the planning, architectural integration, system design and deployment for all low voltage systems including audiovisual, inpatient systems, infrastructure, paging, security, telecommunications, videoconferencing and wireless networking. Currently, we are helping with the technology impact of the seismic renovation and retrofitting phases and moving services before departments need to relocate in advance of the demolition of existing facilities. We have been working on make ready projects such as PBX relocation, Building 3 Seismic Upgrade, Interim Pharmacy and Nuclear Medicine/CT/MRI trailers. What are the Next Steps for the Tarzana Reimagined Project? The construction documents for the Main Tower part of project are currently being reviewed by the California Office of Statewide Health Planning and Development, also known as OSHPD. OSHPD regulates the design and construction of healthcare facilities in California to ensure they are safe and capable of providing services to the public. This review should be completed in 2018 and construction of the new Patient Tower should begin in 2019. The anticipated completion date for the entire project ranges from 2022 to 2024. In the meantime, construction is currently ongoing for make ready phases in the project. We are designing the move of the PBX to a new location and assisting on the seismic retrofit. The seismic retrofit in the existing Tower entails installation of massive girders in the ceiling to support the floor above. Since there is a lot of infrastructure in the ceilings – including technology cabling, power and cooling – we are designing how to move or re-route the technology cabling.